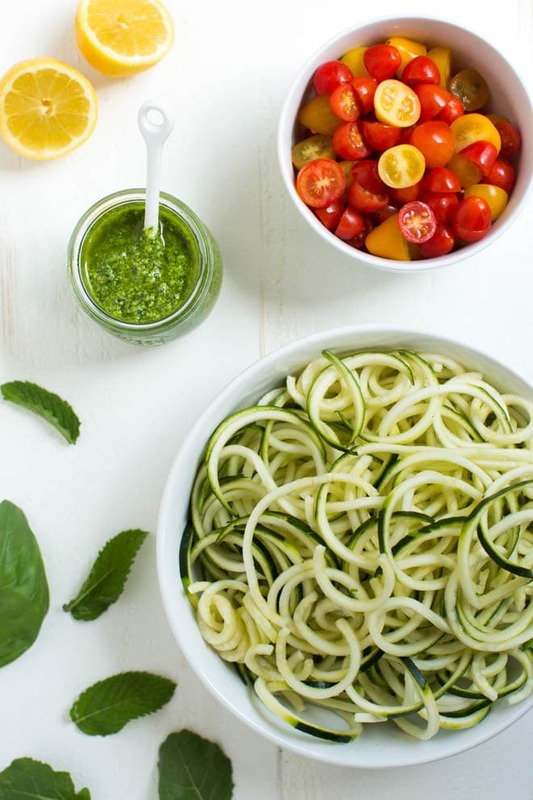 Kale Mint Pesto Zoodles is a quick and easy dinner recipe that comes together in less than 15 minutes! 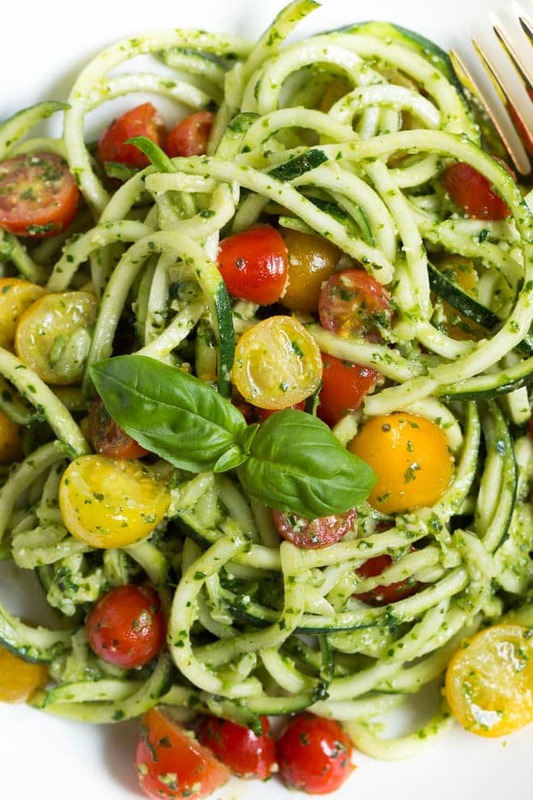 Spiralized zucchini noodles are sautéed with a homemade kale mint pesto and cherry tomatoes. Summer is right around the corner! Can you believe it? 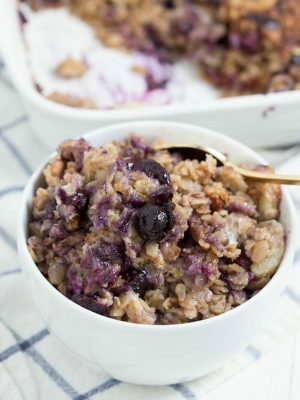 As we head into the summer season, you will need even more quick and easy recipes to make meal planning easy. 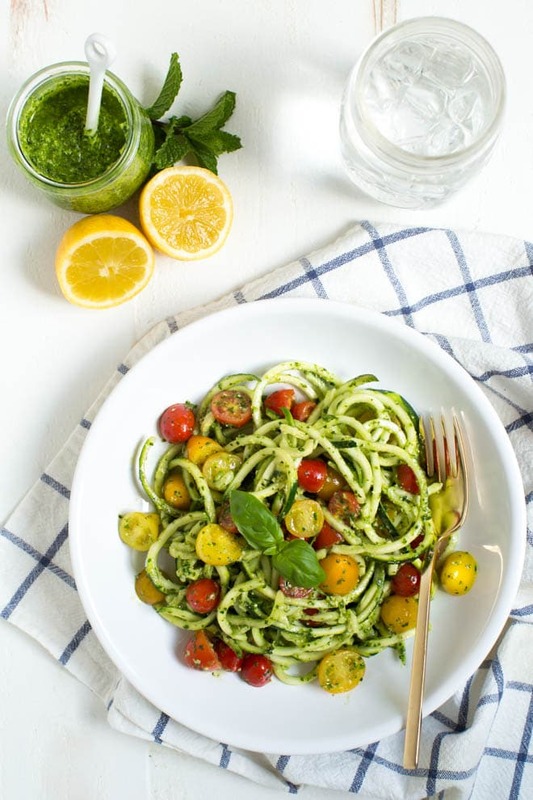 Thanks to these Kale Mint Pesto Zoodles, your dinner options are even better! 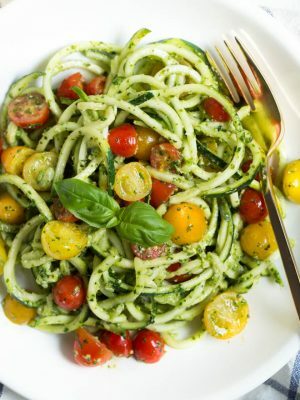 Spiralized zucchini noodles and halved grape tomatoes are sautéed in a flavorful homemade kale mint pesto sauce. 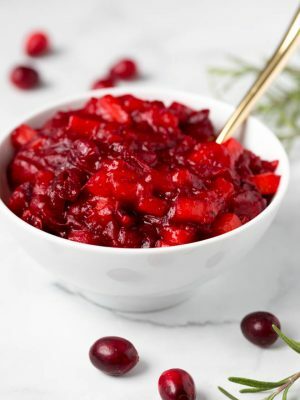 The entire meal comes together in less than 20 minutes to create an easy yet impressive meal for weeknight dinners, dinner parties and more. 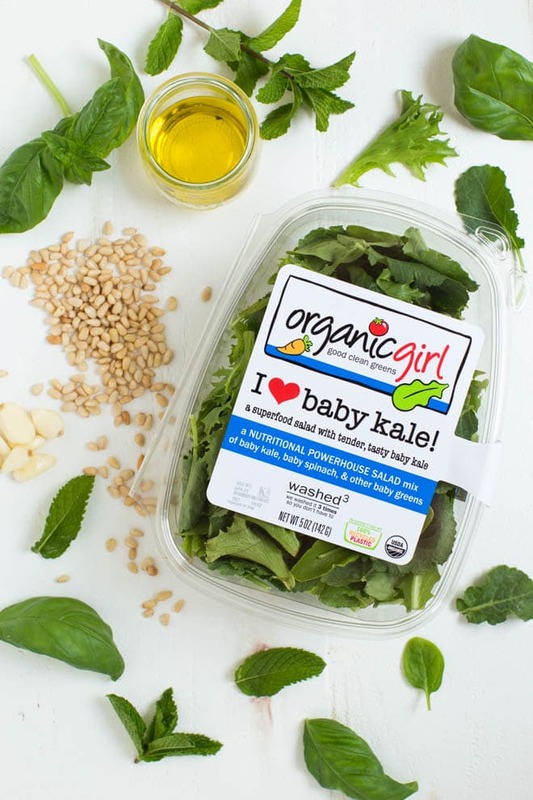 For this recipe, I used organicgirl i heart baby kale combined with mint and other classic pesto ingredients to create a kale mint pesto packed with plenty of flavor and green goodness. Best of all, the entire meal is prepped and cooked in less than 20 minutes. You can even prep the meal in advance by making the pesto and storing it in the refrigerator for up to five days. 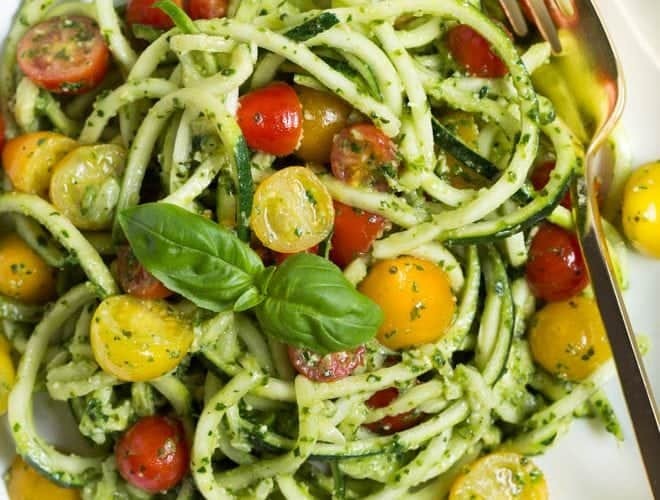 Spiralize the zucchini and halve the tomatoes in advance too. When you are ready to enjoy the meal, you will need only 5 minutes to cook! Spend less time in the kitchen this summer but still enjoy a meal that is packed with nutrients and flavor. While this dish is filling, I also love serving it with salmon or my favorite Spinach Chicken Parmesan Meatballs. The more greens the better! 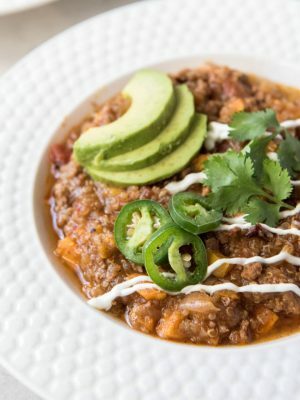 Don’t forget to follow organicgirl on Instagram for even more recipe ideas. 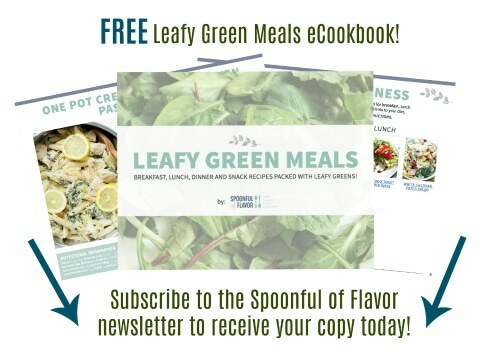 Check out their online store to order fresh greens shipped direct to your home. Tip: I use my KitchenAid Spiralizer attachment to spiralize the zucchini. 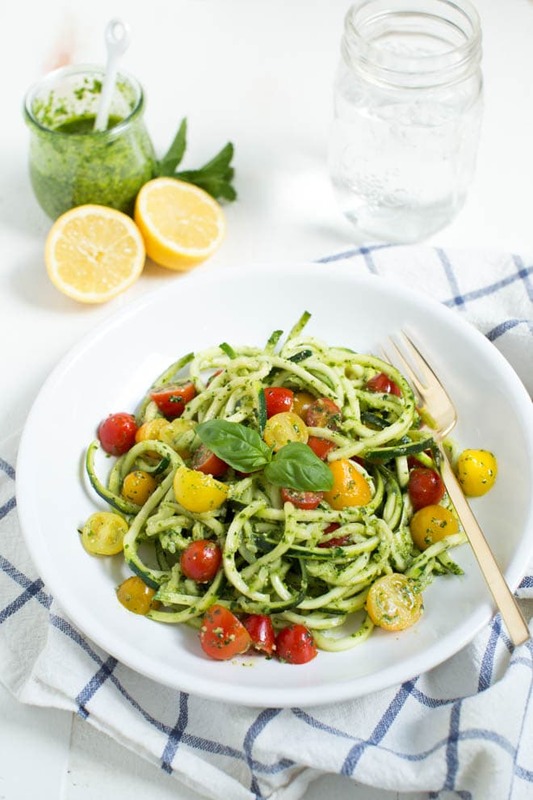 Kale Mint Pesto Zoodles is a quick and easy dinner recipe that comes together in less than 15 minutes! 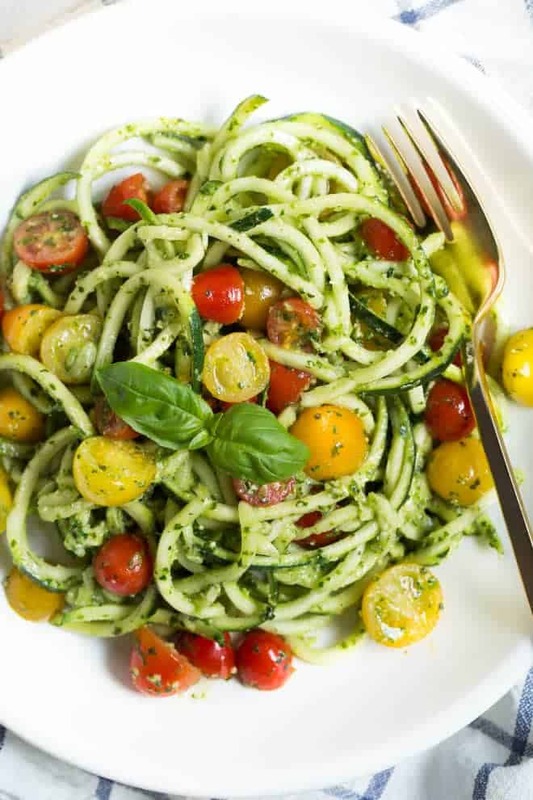 Spiralized zucchini noodles are mixed with a homemade kale mint pesto and cherry tomatoes. Combine the i heart baby kale, basil, mint, garlic, 1/3 cup olive oil, parmesan cheese, pine nuts and lemon juice in the bowl of a food processor. Pulse until smooth. In a large nonstick skillet, heat the remaining two tablespoons of olive oil. Add the grapes tomatoes and cook, stirring often, for 2 minutes. Add the zucchini noodles and cook until softened, about 3 to 5 minutes. Add 1/2 cup pesto, or more as desired. Stir until the noodles are coated with pesto. Serve immediately. 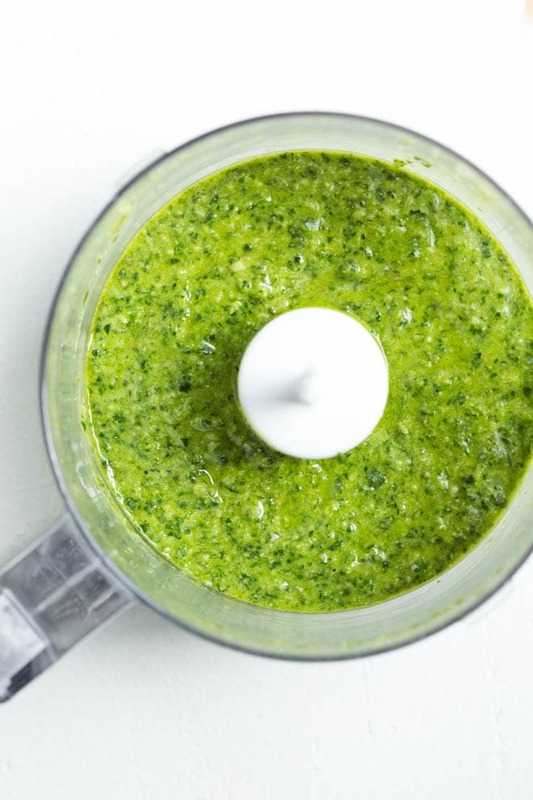 Store any leftover pesto in the refrigerator for up to five days. Enjoy! This recipe make a full batch of pesto, however you only need about 1/3 to 1/2 of the batch for the 4 servings of noodles. The nutritional information below includes using 1/2 of the pesto with the noodles and tomatoes.